PDM software or PLM software: what's the difference? Product lifecycle management (PLM) is often defined as an evolutionary improvement of product data management (PDM). However, it's much easier to decide what you need by focusing on the technical differences between PDM and PLM. Originally, engineering data was relatively simple: design files, parts lists and specifications. At the time, engineering data management software (EDMS) and later PDM allowed users to organize their product data, and apply rules for item identification and revision control. An associated electronic data library contained 2D CAD files and other design files. Product data management, when combined with CAE/CAD software such as Dassault Systèmes SolidWorks or Autodesk® Inventor®, is a specialized "design environment". The basic design object is a CAD file. The PDM tool manages sets of linked files — CAD models — in hierarchical (real or virtual) folders. Product lifecycle management is a cross-organizational tool for collecting, controlling and publishing approved product configurations. In PLM, part and document objects are represented in a database, and managed by change forms. Unlike PDM, part and document records exist independently of files. There are good reasons — technical and operational — why these solutions have become distinct. Computer files are the building blocks of a 3D CAD model. Multiple files may be combined to model an assembly of parts or, sometimes, a single part. A single parameter-driven file can also represent several parts with distinct part numbers. CAD software usually requires a proprietary file format that often contains links between related CAD files. Part information can be attached to file records ("model annotations"). Supporting documentation that's not contained in the model (requirements, procedures, qualified sources, etc.) may need to be managed elsewhere. Change workflows operate on individual files, not necessarily complete part objects. There may not be a one-to-one relationship between a CAD file and a part, and a CAD file generally can't represent non-mechanical information required for production. In short, the computer folder/file system is the natural data environment for working with CAD files. Mechanical 3D CAD models require specialized file managers — a product data management (PDM) tool — to create, edit and move file relationships. Item re-use often requires copying the physical file from one model to another, or coordinating several models. Most CAD vendors provide their own PDM tool for these purposes. A relational database is the natural data environment for PLM objects. These objects can represent a physical part, assembly or document; a customer requirement or supplier part; a change process; and many other data types. These records contain useful properties over the object's design lifecycle: part/document number, item category, revision, title, unit of measure, bill of materials, cost, mass, regulatory compliance details, file attachments, etc. These objects are easily linked to other objects to build a product structure. Objects and their relationships are quite flexible: they're simple to create, customize, revise, re-use and remove. PLM systems have different classes of objects (primarily parts, documents and change forms) with distinct properties and behaviors. A bill of materials is a collection of database objects; document references and approved vendor sources are object lists. Change forms can directly act on objects by, for instance, releasing a revised part and automatically ensuring all BOM components and supporting documents are released simultaneously. An object's Appears On (or "where used") displays its parent assemblies, referencing items and releasing/canceling change forms. Advanced configuration management concepts, such as revision-interchangeability on BOMs, can be handled automatically. Since a PLM system is a database, it easily supports part-driven CAD (like Altium Designer and OrCAD CIS) and data transfers to ERP/MRP. In a PLM system, a CAD file (or set of files) is simply one of many attributes that describe the part. Non-CAD files can also be attached, such as a Microsoft Word specification, vendor datasheet PDF, or even a customer email. Files can be attached to change forms and organization records. A PLM system can index the text contents of a file, and open a file with whatever Windows application recognizes its file type. File attachments can have different contexts. Revision files directly define how to fabricate, purchase or assemble the item. Item files provide background or history. External links point to useful resources outside of the PLM system, such as vendor web pages. The PLM many-to-many product structure simplifies object re-use by adding links between objects, rather than by physically copying them. There is no known way to handle the complex interrelationship between parts without access to a well designed Product Data Management system. A PLM system is even more useful! There can be overlap between PDM and PLM roles. In many companies, PLM and PDM tools are used side-by-side. A PDM system has deep knowledge about the CAD file model; a PLM system has broad knowledge about the product definition and relationships. PDM software provides engineers and designers with tools for managing linked multi-file CAE/CAD models. CAD models exist within the computer file system as folder/file hierarchical trees. A file is usually re-used by copying it into a new model, and a design change may need to update many interrelated files. All of these require some type of "design environment": mechanical CAD with model management; electronic circuit design and simulation; software development with source control; graphics tool; or simply a word processor. Each of these design environments produce design files that are coordinated with the other disciplines to ensure a coherent product. The CAD model won't include non-mechanical documents such as schematics and procedures, or essential physical item records such as user manuals. PDM tools often ignore documentation affecting marketing, quality, product support, service, and disposal. PDM attributes may be locked within proprietary file formats, and can't easily be shared with other applications. A PDM tool is most useful for managing interrelated file-based models within a specific discipline, such as mechanical design. PLM software provides all disciplines (design, product management, quality, production, test engineering, marketing, etc.) with a complete, approved and locked-down product configuration. Product information is divided between what's required specifically for engineering development, and what's needed to manage, purchase, manufacture and service the product. PLM software manages an approved configuration of your complete product over the entire product life cycle. A PLM solution is most useful for defining, controlling and sharing complex, multi-discipline, or fast-changing products. The normal mechanical CAD/PDM/PLM interaction consists of: creating part numbers within the PLM system; using those part numbers during your CAD/PDM model development; exporting the bill of materials from CAD for import into PLM; and attaching models (file sets) as approved, controlled snapshots of the 3D model. The file set (and related specifications and procedures) is approved within the PLM system and released to your production and supply chain. PLM coordinates design intent and provides an orderly flow of approved data. PLM ensures that only the correct parts are ordered, produced and assembled according to valid & approved documentation. PLM is the central repository of the product definition: requirements; drawings; supplier datasheets; test results; assembly, test and inspection procedures; user documentation; and technical field support materials. PLM systems prevent costly errors related to unapproved part substitutions, out-of-date documentation, incorrect part numbers, and even many clerical errors in transferring final designs into production. They can also answer questions about what had previously been used, who made changes and why, and what alternatives were considered and rejected. Revision-controlled bill of materials and approved source management that can be easily exported to downstream production systems. Virtually unlimited change forms and change workflows that can be uniquely tailored to a specific department's needs, so that upstream (marketing) and downstream (customer support, field service) organizations can manage their part of the product life cycle using their own change processes. Materials identification and reporting for simple and cost-effective RoHS/WEEE/ELV regulatory compliance in product maintenance and repair, hazardous material handling and product disposal. Document and part dispositioning to clearly communicate how items throughout the supply and distribution chains will be affected by pending changes. 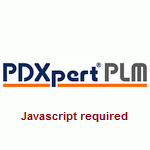 PDXpert PLM software ensures that your entire product data history, from product definition to product retirement, is captured and maintained by all groups within your organization.